We have tried all techniques here, the character of the rivers just stress the plastic to the point of no return very quickly. The band aid method, uses long strips 1' 1/4 inches thick for best results in all cracks, it also allows you to do turns and shapes since you will melt the plastic strip a little more than the hull. You don't want to mess up the hull because you can replace the band aid several times if you have a good hull to work on. We go through so many kayaks that we have plastic for all brands but at the end don't matter, I actually go by colors. Finding the perfect point where you melt the strip a little bit more than the plastic around the crack is clutch. So when you push down a little bit of melted plastic (from the strip preferable) if it comes from both is ok but don't want too much melting. You need to work on HIGH heat and be quick so you can melt the surface of the plastic mostly to prevent the hull to over heat and deform or simply weak that area by melting it too much.. Angle grinder is crucial, watch your fingers and don't breathe the dust.. smooth edges o prevent catching on rocks and be careful to not touch the hull with the grinder or you will be making a larger patch job. 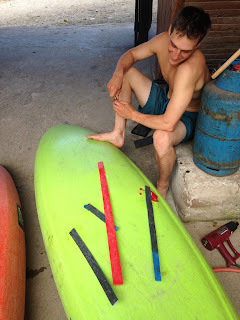 The band aid is the best plastic kayak welding technique we have come across in Ecuador where boats come to die.